IN THE THIRTEENTH AND FOURTEENTH CENTURIES there was a violent earthquake and volcanic eruption in the Azores Islands, 1,000 miles from the reigning Queen Isabel of Portugal. The most seriously hit was the Island of Pico. The people of these Azores Islands could not survive the drought, crop failures and famine that now plagued them. They gathered together in earnest prayer to the Holy Ghost for help. He who feedeth the Raven heard their prayers, and on the morning of the Pentecost Sunday there was a great rising sun and the people of these islands saw in the sunrise a ship coming into the Port of Fayal. This ship was laden with the necessities of life. The food was distributed among the people of the various islands and they were very grateful that their prayers had been answered. When their Queen Isabel heard of this providence, she organized a solemn procession in honor of the Holy Ghost. Accompanied by her maids, she carried her Crown through the streets of Lisbon, to the Cathedral, where she left if on the Alter as an offering of thanksgiving for the favors the Holy Ghost had given her people. When Queen Isabel's husband (King Dinis) died, she took the third Order of Saint Francis. In 1612 her body was taken up to be put in a new shrine, and was found to be in corrupt. Two centuries after her death, she was canonized by Pope Urban VIII. Queen Isabel's body still remains in a Silver and Crystal Casket at the Cathedral in Coimbra, Portugal. All the people of these Islands vowed that they and their children and their children's children would commemorate the Pentecost Day by giving thanks to their Queen Isabel for the great sacrifice she made in giving her Crown as a thanksgiving to the Holy Ghost. Traditionally, the seventh Sunday after Easter is a Thanksgiving Day for the Portuguese descendants, a special dovotion to the Holy Ghost on this Pentecost Sunday. The celebration of today is the keeping of the tradition of yesteryear, and re-mindful of the hardships suffered by those who so long ago have passed to the great beyond; to show those born in later years the thankfulness of real sacrifice. The Holy Ghost Festival starts on the eve of Pentecost Sunday. A procession with the members of the I.D.E.S. Society and a band take the Crown and Scepter to the Church. Both of these symbols are blessed at a special service, after which they are taken to the Society's Chapel to remain over night. Following the procession there is a dance in the I.D.E.S. Hall. On the following morning, at 10:00 a.m., the main procession leaves the Society's grounds, consisting of different units. 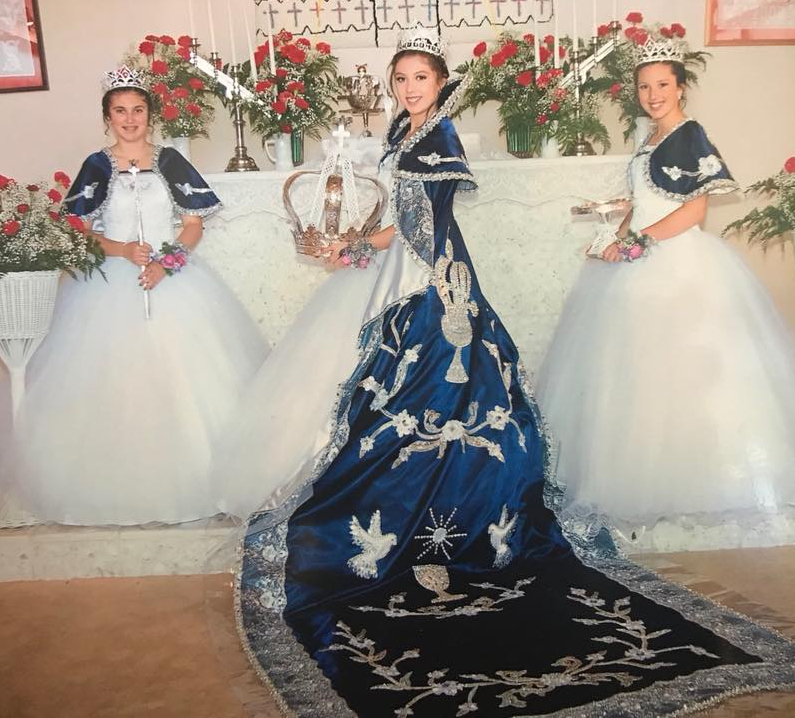 At the end of the procession comes the Queen (who represents Queen Isabel) with her maids. The Queen and her maids walk inside four rods held by young girls. The Crown and Scepter are carried to the Church where they are blessed again, this time at High Mass. At noon, the service completed, the procession is led back by the Queen and her Maids to the Society's Chapel, where the Crown and Scepter are placed on the Alter until the end of the Celebration, which lasts three days. At noon the great barbecue feast begins and comers are supplied with generous portions of meat, bread, and wine. When the meal is done the formal Chamarita Dance begins in the small I.D.E.S. Hall and the popular dances are held in the big hall and are invited to participate. In the afternoon there is a large auction where many donated articles are auctioned off the raise money for the following Holy Ghost Celebration. At noon, Monday, there is another barbecue attended for the most part by the home crowd. Following the barbecue there is the final auction of the celebration. Another public dance is held in the afternoon, interrupted in the early evening for a rest and continuing until early Tuesday morning. not unitl then is the Festival of the Holy Ghost Celebration officially completed. Through the efforts of the Charitable Organization the Holy Ghost Festival has kept all the charm, grace and dignity it had long, long ago. THE FIRST HOLY GHOST FESTIVAL was held at the home of Mrs. Rose Brown at Frenchman's Creek in the year 1871. The first celebration was a simple and dignified affair. In those days the men lead the solemn procession. The Crown was carried to church, where a Mass was held and the Crown was blessed by the Priest. The procession then returned to Mrs. Rose Brown's home where the Crown was place on display for everyone to see and give their offerings. CHAMA RITA! CHAMA ROSA! QUE BONITA! QUE FORMOSA! COME UP RITA! COME UP ROSA! HOW PRETTY! HOW BEAUTIFUL! People of all ages enjoyed dancing to the Chamarita in the early years of the Holy Ghost Festival, as they also do today. The festivities lasted four days and nights. This became traditional of the Holy Ghost Festival in Half Moon Bay. The festival successively moved from the property of Mrs. Rose Brown to the Antone George property on the estate of Manuel J. Silva. Later, it moved to the Antone De Brum property, and to other homes in the area, then to the present I.D.E.S. grounds. The early Portuguese men for the most part were simple, earnest men who asked nothing in return other than the pleasure of having the celebration become a tradition and take root in this land and grow. These are some of the men who pioneered the Holy Ghost Festival. There were others who worked for the celebration, but they did not actively transplant this interesting religious and social festival to their adopted land. Antome George was one of the first pioneers who was active in the fist celebration. He also was one of the original founders of the I.D.E.S. Society. Manuel P. Dutra Sr. was born in Fayal, Azore Islands in 1839, and died in 1923. He was the man who donated the land which is the present I.D.E.S. grounds. John Valladao was the first President of the I.D.E.S. Society. He emigrated from Portugal when he as a youth. Frank S. Martin also emigrated to the United States from Portugal. He was one of the most active of the Society Founders. Manual P. Cunha Sr. came to America from the Azores Islands when he was 21. His brother Joseph Cunha was also active in furthering the Holy Ghost Celebration. Manual Miller Sr. emigrated from Pico Island. Although he never held office in the Society, he was one of its most influential members. Manual Bernardo came from the Azores Islands at the age of 33. He became Vice-President of the Society. Condido Fernandez was the first Treasurer. He was entrusted with the silver dollars that were used in the making of the new Crown. Antone Bello, one of the original founders, he emigrated from the Azores Islands. John Bettencourt, who later became another President of the Society, came to this country at the age of 22. John Cunha was 19 when he left Grocios, Graciosa Island to come to America. He was an organizer and field worker of the Society. Descendants of these men and other groups of families have kept the Festival a tradition in Half Moon Bay for a hunderd years. Hopefully it will stay this way in generations to come.